A photo of the nesting green sea turtle taken by Irene Forget. Nature Foundation urges the limiting of beach bonfires and artificial lighting on nesting beaches. SIMPSON BAY:--- The first Hawksbill Sea Turtle nest of the season has been recorded and protected by the St. Maarten Nature Foundation. 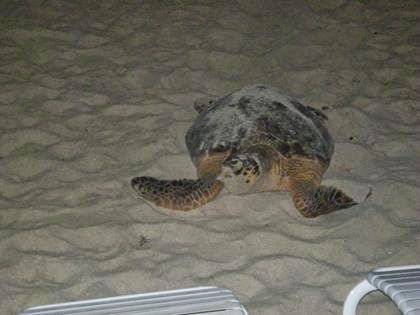 Last week a Female Hawksbill Sea Turtle laid a clutch of eggs on Simpson Bay Beach. Nature Foundation staff recorded the nest and cordoned the area of the nest off. Sea turtles have existed for well over 180 million years, even before the dinosaurs. St. Maarten is one of the few places in the region that has a nesting population of sea turtles, so all should be done to protect their nesting areas. Sea turtle population numbers have plummeted to dangerously low numbers throughout the past century due to human impacts, bringing many species close to extinction and causing them to be listed as critically endangered. In order to reverse this trend, all sea turtle species are now protected by international laws and treaties as well as local laws. Based on ARTICLE 16 and 17 of the Nature Conservation Ordinance St. Maarten it is illegal to kill, wound, capture or pick-up sea turtles. It is also illegal to directly or indirectly disturb their environment resulting in a physical threat or damage or to commit other acts that result in disturbance of the animal. It is also forbidden to disturb, damage or destroy sea turtle nests, lairs, or breeding places. Also, it is forbidden to pick-up or to destroy the eggs of any species of sea turtle. The St. Maarten Nature Foundation actively manages the sea turtle population on St. Maarten, particularly during the nesting season. The Foundation conducts various activities with regards to nesting females including beach surveys, nest excavations, tagging activities, and nest success research. The Foundation also relies heavily on volunteers to assist it in its Sea Turtle activities and welcomes any volunteers who would be interested in working with sea turtles. Beach communities in particular are in the best position to help ensure that females nest safely, that nests are left undisturbed and that hatchlings make it safely to the sea. This year the Nature Foundation also urges restaurants and beach bars along the major nesting beaches to refrain or limit the use of beach bonfires and artificial lighting that can seriously reduce the survival rate of sea turtles. The Nature Foundation asks that people also do not drive on the nesting beaches and that they walk their dog on a leash. To report nesting activity or illegal activity, please call the Sea Turtle Hotline 9229 or call the Nature Foundation office at 5444267 or email the Foundation at info@naturerfoundationsxm.org.